There are always burning questions as New England Fights flips the calendar into a new year. Based on the fan voting at the end of a wild 2018 campaign, one occupies everyone’s mind: What can Kam Arnold possibly do for an encore? Arnold, a relative newcomer from Casco, Maine, posted the second and third opening-round knockouts of his young career, including an 11-second demolition of David Thompson. He followed that by fighting Killian Murphy on short notice and earning an unforgettable fourth-round stoppage to win the organization’s amateur bantamweight title at NEF 34 in June. That decision locked up fighter of the year honors, a distinction that immediately puts the outspoken Arnold (4-0) in some serious company, as he explained in a recent interview on “This Week in MMA” with Craig and Matt Allen of Fight Night Picks. Arnold already harbors similar expectations for himself. He hinted at a major fight announcement in the near future and sees it as a springboard to his continued meteoric rise. His scrap with Murphy – a substitute after Arnold spent much of his fight camp preparing for the more wiry Mike Crespo – was a testament to the champion’s focus and single-minded determination. “They said, ‘You want to fight this?’ And I’m like, ‘Yeah, that title’s mine, I don’t care who it is, I’m fighting him.’ I had two weeks to prepare for Killian, who is a state champ wrestler, so that changed up my game plan, but (I was confident) as long as I imposed my will,” Arnold said. When it was over, Arnold was relieved to find an opponent who finally pushed him. He worried that the series of quick wins over Glenn Kasabian, Kyle Kenney and Thompson weren’t conducive to his pursuit of long-term glory. Other athletes and teams make the most of so-called bulletin board fodder. Some would say the New England Patriots used it to their advantage in the run to their latest AFC championship. When rivals, journalists or even fans utter words that may be veiled insults, they become motivational medicine. Arnold is no exception. He heard the whispers that he hadn’t been tested, or that Murphy was a superior wrestler, or that someone able to take away Arnold’s stand-up acumen would enjoy better results. “I felt in some cases slapped in the face since I first started,” Arnold said. “I think that’s what carries the chip on my shoulder. That’s why I keep on going, keep on going, keep on going. 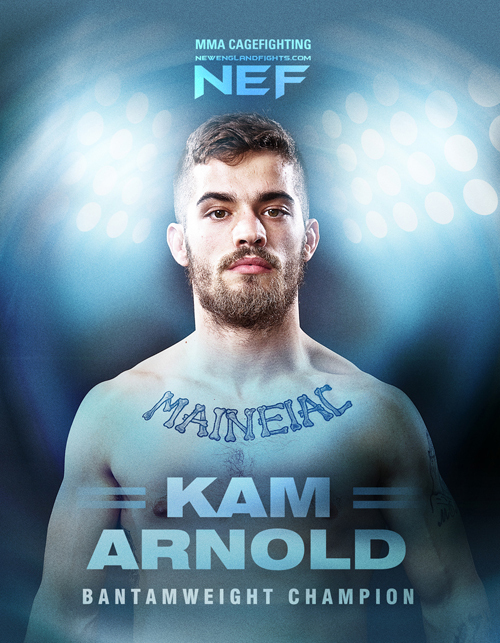 Although he has settled into a comfort zone at 135 pounds, Arnold said he isn’t against moving up a weight class or even two if it will help expand his options for opponents. Being the smaller, underestimated guy doesn’t bother him much: Arnold grew up as the youngest child in a family of all boys. He described it to the Allen’s as a rough upbringing in which the last child in life had no choice but to fight for what he wanted. While Arnold still is making his mark in the amateur ranks, he considers mixed martial arts his profession and career path. Beginning with the fight he’s eyeing on the immediate horizon, every camp this year is a likely building block toward those aspirations.